AMERICAN IDOL continued to decline. 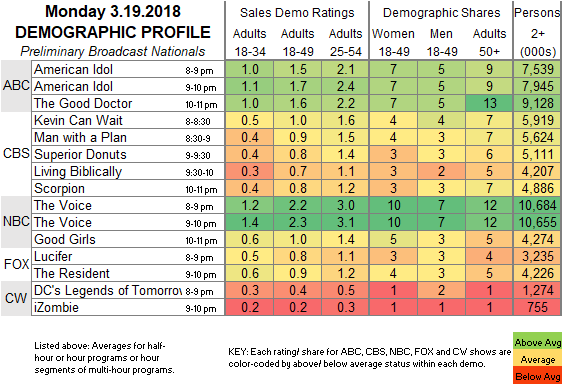 ABC: AMERICAN IDOL and THE GOOD DOCTOR both dipped 0.2 to 1.6. 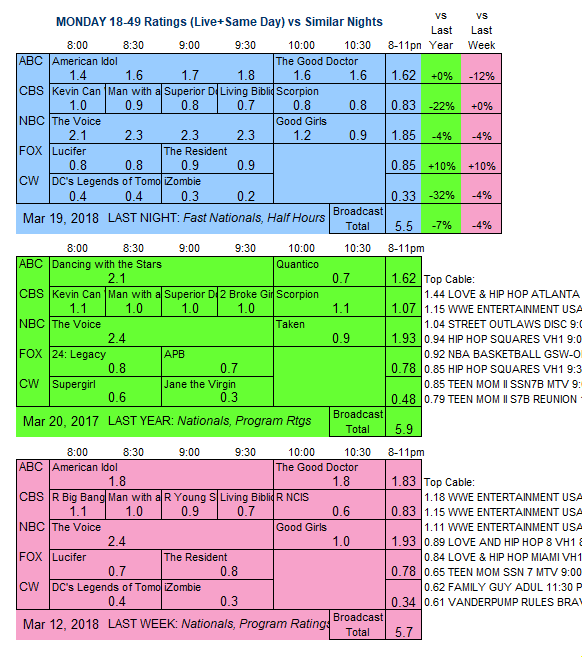 NBC: THE VOICE was down 0.1 to 2.3, and GOOD GIRLS held at 1.0. CBS: KEVIN CAN WAIT returned from a week off down 0.1 to 1.0, MAN WITH A PLAN slipped 0.1 from last week to 0.9, SUPERIOR DONUTS returned down 0.1 to 0.8, and LIVING BIBLICALLY remained at 0.7. SCORPION was steady at 0.8. FOX: LUCIFER (0.8) and THE RESIDENT (0.9) were each up 0.1. CW: LEGENDS OF TOMORROW held at 0.4, but IZOMBIE dropped 0.1 to 0.2. SHADOWHUNTERS returns to Freeform tonight.